The EU and the UK are still talking, and Prime Minister Theresa May will update Parliament about Brexit on Tuesday. There are less than 50 days to go until Brexit officially happens, and the United Kingdom still hasn’t approved a final divorce deal with the European Union. The UK remains stuck in the same bind it’s been in for the past few weeks — unable to stomach Prime Minister Theresa May’s current Brexit withdrawal agreement, seeking concessions from the EU its officials are probably not willing to give, and failing to agree on little except the desire to avoid leaving the EU without a deal on March 29, 2019. This next week could change things — or maybe not. We’ll find out a bit more about where things stand on Tuesday, when Prime Minister Theresa May gives an update to the UK Parliament on the status of Brexit. After May gives her update, Parliament will draft and debate amendments to try to give themselves more say over the Brexit process. The vote on those amendments is currently scheduled for Thursday. But that’s not the so-called “meaningful vote,” in which Parliament will vote (yet again) on an actual final Brexit agreement. That probably won’t happen until the end of February, a mere month away from the March 29 Brexit deadline. Time is running out. So are the available options — and the Brexit impasse is already taking a toll on the British economy. There’s a lot of stuff going on, so to catch up and keep track of what’s happening next, here’s a breakdown of the past (roughly) 72 hours in Brexit news. Prime Minister Theresa May met with EU leaders last week, her first trip to Brussels since the UK Parliament voted on January 29 that she should renegotiate elements of the unpopular Brexit deal. May was specifically seeking a new solution to the “Irish backstop,” the part of the Brexit deal that is intended to avoid any border checks between Northern Ireland (which is part of the UK) and Ireland (which is an EU member state) springing up as a result of Brexit. Hardline Brexit supporters in May’s Conservative Party see the current arrangement May has worked out with the EU — which would require the UK to follow the same customs regulations as the EU — as potentially trapping the UK within the EU indefinitely, and they want her to come up with a better solution. The EU, though, has said it will not renegotiate the backstop, as it’s part of the painstakingly negotiated withdrawal plan they’ve already agreed to and have no incentive to reopen. But May still has to try, and she met Thursday with EU leaders in Brussels and Irish Prime Minister Leo Varadkar in Dublin on Friday. 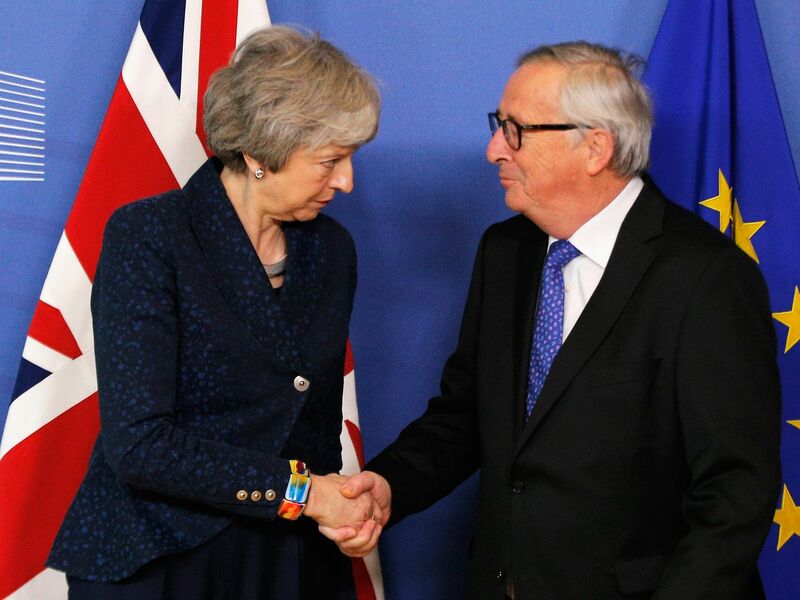 After the talks in Brussels, May and EU Commission President Jean-Claude Juncker issued a joint statement in which they described their discussions as “robust but constructive” and recommitted to finding a way to get a Brexit deal through Parliament that also works for the EU. European Council President Donald Tusk (who drew the ire of Brexiteers earlier last week for saying there was a “special place in hell” for those who promoted Brexit without a plan) also said the UK and EU would keep talking. And Varadkar told May the Irish government and the rest of the EU believe the backstop has to stay. So nothing much has changed. But talks on this seemingly intractable issue will continue this week, regardless of how futile they might be. UK Brexit Secretary Stephen Barclay will meet with EU negotiators on Monday, bringing recommendations from a Conservative MP working group on “alternative arrangements” that the EU probably won’t go for. Michel Barnier, the EU’s chief Brexit negotiator, has said ahead of these meetings that the EU won’t reopen the backstop issue, but that it’s willing to rework the political declaration, which lays out the commitment for a future EU-UK relationship after Brexit. The political declaration is purposely broad, but the EU has said it’s willing to make it more specific — if the UK can say for sure what it wants. “Something has got to give,” Barnier told reporters Monday. It’s just not clear at this point if anything will. One of the (many) criticisms May has faced during this whole years-long Brexit negotiation debacle has been her apparent unwillingness to build cross-party support for Brexit. Critics say she has failed to get buy-in from moderate members of both her own Conservative Party and from the opposition Labour Party, all of whom want to avoid the economic and political shock of a hard Brexit. But there was a glimmer of hope for a possible breakthrough last week, when May and Labour leader Jeremy Corbyn met for private discussions. Corbyn is in a bind because he doesn’t want to support a second referendum — putting another vote on Brexit to the British people — which many in his party want him to do if May can’t close the deal. And May is in a bind trying to seek concessions from the EU on the backstop that they’re not willing to give. So maybe, the thinking went, the two could figure something out. So they sat down to talk. Afterward, Corbyn followed up on Wednesday by presenting May with some conditions under which Labour would support a Brexit deal. The demands revolved around that political declaration I mentioned earlier. Corbyn asked May to offer more concrete commitments on what a future EU-UK relationship will look like. Specifically, Corbyn asked that a commitment be made to keep the UK involved in a customs union with the EU (which means the UK would follow the same customs rules as the rest of the EU). That’s something May has previously ruled out, as membership in a customs union means the UK can’t make its own trade deals. Many moderates and business-minded Conservatives would probably go for such an arrangement — though it would likely split May’s party, with hardline Brexiteers opposing it. But May responded to Corbyn’s proposals on Sunday with a letter that basically said, “Thanks, but no thanks.” She objected to membership in a customs union again because of trade deals. “I am not clear why you believe it would be preferable to seek a say in future EU trade deals rather than the ability to strike our own deals?” May wrote to Corbyn. May did offer some commitments on other issues Corbyn raised, including labor and environmental rights, but this is far from the game changer in the Brexit debate some were hoping for. It turns out that spending two years negotiating a Brexit deal and still not coming up with a solution hasn’t been particularly great for businesses in the UK. The uncertainty over Brexit delivered Britain its worst economic numbers since 2012. According to the UK’s Office for National Statistics, economic growth slowed to just 0.02 percent in the last quarter of 2018. Business investment also fell for the fourth quarter straight, according to the Associated Press, which hasn’t happened since 2009, during the global financial crisis. The economic data echoes a warning last week from the Bank of England (the UK’s central bank) that the “fog of Brexit” is forcing businesses to rethink investment and households to rethink their spending. “Although many companies are stepping up their contingency planning, the economy as a whole is still not yet prepared for a no-deal, no-transition exit,” Bank of England Governor Mark Carney said last week. Of course, with less than 50 days to go and no plan in sight, the economy will continue to react. And if a deal can’t be reached, the economic consequences will be catastrophic. May moves up her update to Tuesday. Will Parliament step up? May will deliver an update to members of Parliament on Brexit on Tuesday and try to win support for her current strategy — which basically just involves trying to win more support for her deal, with changes to the Irish backstop. May will likely include a report on her visit with EU leaders last week and any progress her government has made on the backstop. Which means she probably won’t have a lot to say. Members of Parliament, however, will get a chance to respond, and either support her current course or introduce amendments that could help Parliament take more control of the process. They’ll vote on those amendments Thursday. If this sounds somewhat familiar, it should. Parliament did something similar last month, and it’s possible that many amendments similar to those that failed or got dropped last time will get another vote, including one that would have forced May to get a Brexit deadline extension if she couldn’t pass a deal by a certain date. But Parliament mostly punted last time: Instead of taking control, it sent May back to Brussels on this doomed mission to renegotiate the backstop. It also passed an amendment saying that Parliament rejects leaving the EU without a deal, but it wasn’t binding, so it didn’t actually force May’s government to do anything. Whether things will be different this time around is still unclear. Labour MPs have said they’ll introduce an amendment that will demand May puts any Brexit deal to a vote by February 26. Yet members of Parliament are still bitterly divided, and May’s likely to make the case to her Conservative Party that she’ll deliver to Parliament if she just has a little more time. But despite what May might say, when it comes to Brexit, time isn’t really on anyone’s side. I’m a geophysicist. My signature fieldwork uniform is bright pink.